Today I chatted with a dear godbrother of mine. 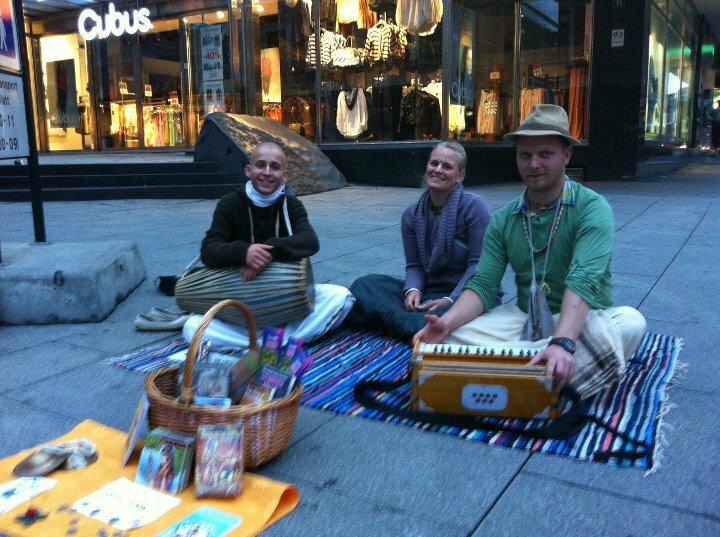 He is a german devotee, and he spent some time here in Oslo last summer. He was staying with my husband and me for a week, and him and I went out on the streets with books every day. He was such an inspiration for me. Always asking me at home if I needed help with something, and always in the mood of serving the Vaisnavas. Here we are having a harinam in Oslo. Talking with him always brings me up. Even when he is feeling down, somehow he always inspires me to be just a little bit more Krishna conscious. Today he told me how he's been having some problems with his japa, I asked him if he would do me a favour (I knew he would say yes :-) ) and I asked him to chant one round tonight. He said yes! Even if we just chant one round everyday, it is still the most important service we do for Krishna. Prabhupada Letters, 1970 October 23: "I am so much pleased that you are carrying on the Street Sankirtana Party even though you have sometimes only one companion. This spirit is most satisfactory so please go on and you may rest assured that Krsna will always help you in any difficulty." Prabhupada Letters, 1970 February 11: "Sankirtana is our life and soul, and if we execute this transcendental business in all earnestness, then there will be no difficulty in any way. We should not pray to Krishna anything except to ask to engage in His service. If we are engaged in His service then automatically everything will be revealed." Prabhupada Letters, 1970 January 15: "We have lived there for the last three years and we may live there for another three years, it does not matter, but our Sankirtana program must be executed very nicely. Our most important place is on the street." With this wonderful instructions from Srila Prabhupada, through my dear godbrother, I might have the cur rage to go out on sankirtan (book distribution) tomorrow. At least just for an hour. I pray to Krishna that I will do so.